Deciding what to wear is more fun with a fabulous and functional closet. Especially if you don’t have to dive-in the pile of clothes on the corner, yes that one that you called your “organize pile”. TRU Closet Pros organization solutions transform an ordinary closet space into an elegant retreat that displays your wardrobe in high fashion. Custom cabinets with storage shelves and hanging rods organize every shirt, suit, or sweater in your closet. Corner shelves maximize storage space and provide just the right place for purses, extra pillows, blankets and other bulky items. It’s all in the details. Because TRU Closet Pros closet organizers are custom-built, we can create a perfect storage system that’s perfectly fit for your space and style. 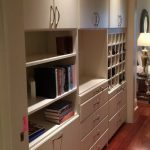 By maximizing the hidden potential of any bedroom closet with a personalized closet design tailored to your needs, style and budget, exceptional storage and organization will be an integrated part of you whether you need a custom walk-in closet or a reach-in custom closet, consider it done.